Holy cow! Squash!?! On Evil Shenanigans!? Believe it or not, even I can’t live by bacon alone – much as I wish I could. Actually, believe it or not, I quite like vegetables. My favorite way to prepare them for daily meals is simply to grill them with a little olive oil and parm, but sometimes I like to get fancy and make something that is rich, creamy, and oozing with cheesy goodness. Yes, even my vegetables are Evil! I think of this more like a macaroni and cheese, just trading the macaroni with spaghetti squash. Sure, it adds nutrition, but I am not as concerned with that as I am with the flavor. 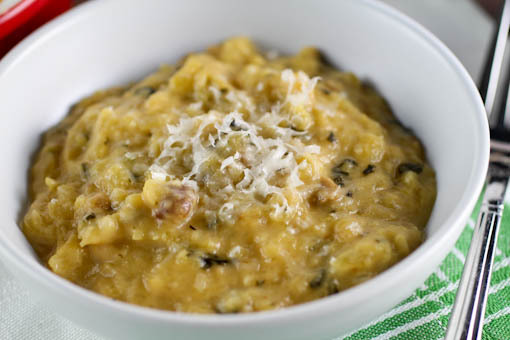 Spaghetti squash has a mild, slightly sweet, nutty flavor that plays very well with mild cheeses. Because I like them, and because they taste good, I also added some mushrooms and chopped spinach. I say this is a side dish, but I can easily make this my whole meal. Very easily! 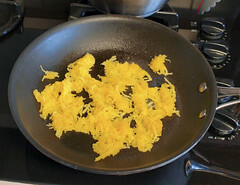 Spaghetti squash is VERY moist no matter how much you try to dry it out (and you must dry it out some for this recipe). 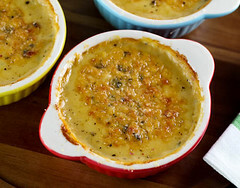 I am telling you this because this casserole is similar in texture to a stove-top macaroni and cheese or risotto, and unless you add a ton of flour or cornstarch this casserole will never be terribly firm. I, personally, love the texture. 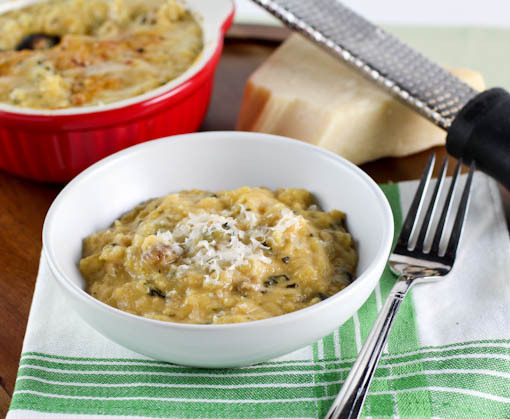 It is creamy, rich, and thickly cheesy. I used mild cheese here as not to overpower the delicate squash flavor, but if you are not a squash fan or you just want more cheesy impact feel free to use a stronger cheese. I think Gruyere, sharp cheddar, and pepper jack would be wonderful substitutions if you want a cheesy bite. **A note for the person who asked me to post this recipe (and you know who you are! ): you can easily make this gluten free as I have done in the past for a GF friend. 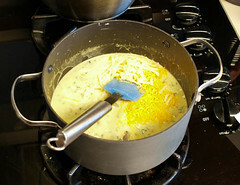 Just whisk 3-4 tablespoons of cornstarch into the chicken broth in place of the flour. Easy-peasy! 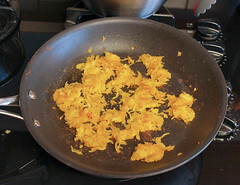 Lightly spray the pan with non-stick cooking spray and add ⅓ of the squash. 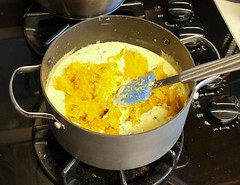 Cook, stirring frequently, until the squash has browned slightly, and the squash has dried out some, about 4 minutes. Transfer the squash to a bowl and repeat with the remaining squash. Set the squash aside. 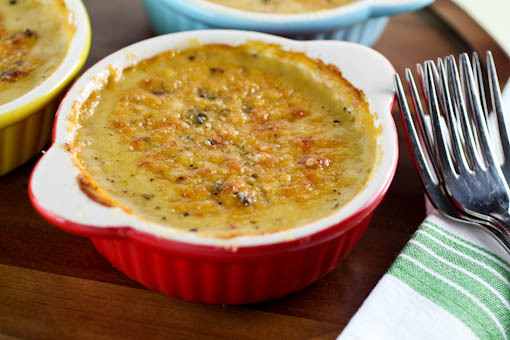 Heat the oven to 375 F and spray 1 1½-quart casserole dish, or 4 8-ounce ramekins, with non-stick cooking spray. In a medium pot over medium heat add the butter. 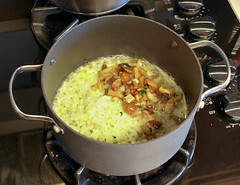 Once the butter melts and starts to foam add the mushrooms and onions. Cook, stirring often, until the onions soften, about 5 minutes. Add the spinach, garlic, red pepper, and thyme and cook until the garlic and spices are fragrant, about 1 minute. Sprinkle the flour over the vegetable mixture and stir to combine. Cook, stirring constantly, until the flour just begins to brown, about 5 minutes, then slowly whisk in the half and half and chicken stock. Add the dry mustard powder and whisk well. 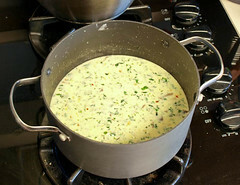 Bring the mixture to a boil, whisking constantly, then reduce the heat to medium low and cook for 3 minutes, or until the sauce is thick enough to thickly coat the back of a spoon. Turn off the heat and add the shredded cheddar and Monterey Jack cheese in three additions, making sure the cheese is completely melted before adding the next addition. Stir in the squash and season with salt and pepper. Transfer the mixture to the prepared casserole dish and bake for 25 minutes. 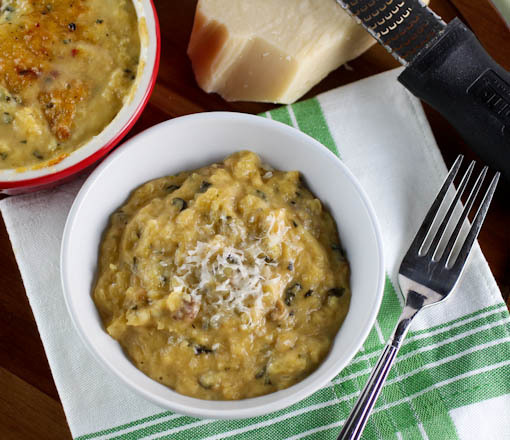 After 25 minutes sprinkle the shredded Parmesan cheese overt he casserole and return to the oven for 20 to 25 minutes more, or until the cheese is browned and the casserole is bubbling vigorously throughout. Remove from the oven and cool for 10 minutes before serving.